Isn’t it the same necklace from yesterday though? As not to be confused with yesterday’s Luxembourger bandeau of amethysts and pearls, here is yet another bandeau from Luxembourg…will it ever end Luxembourg? How many bandeaux are you gonna pull out of that milk crate? Heck, I think you could wear that mouth-watering necklace as a bandeau itself. Look at the size of those rocks! After a full week of Amethysts Ahoy, here we go again, asking which you’d prefer. Well, which one do you like better?The Rectangular Amethyst Bandeau or the Amethyst-and-Pearl bandeau? This entry was posted in amethyst, luxembourg, tiara time! 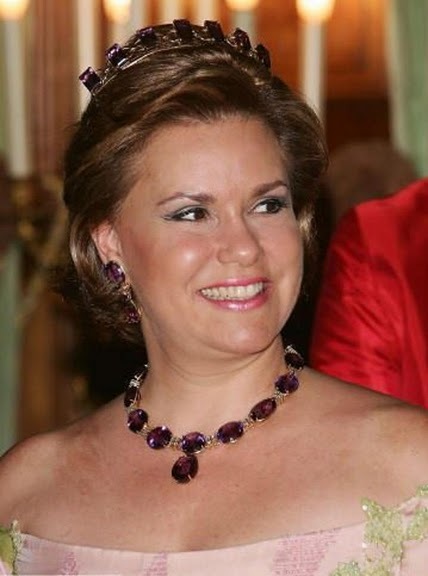 and tagged Luxembourg, royalty, tiara. Bookmark the permalink. the regular amethyst bandeau doesn’t show up as well–a case of blonde would be better. yeah, it doesn’t jive with that chestnut hue, That’s why Stéphanie & Marie Astrid look so sharp in the pearl version. I’d like to see the rectangular amethyst bandeau on Stephie next. How about you?